Warren Kashiwagi eliminates Hong Moon on the first hand back from break. Moon finishes 5th, earning $8,324. 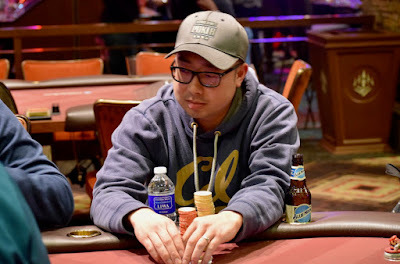 One hand later the 2bb-to-the-final-table run for Will Chao (above) ends when his pocket Nines run in to Sasha Sabbaghian's pocket Jacks. THIS time, Chao can't come from behind to beat Jacks and he cashes in 4th place, taking home $10,802. 3-handed play proceeds, all three players - Kashiwagi, Sabbaghian and Robert Pacleb - having about 1.8 million.